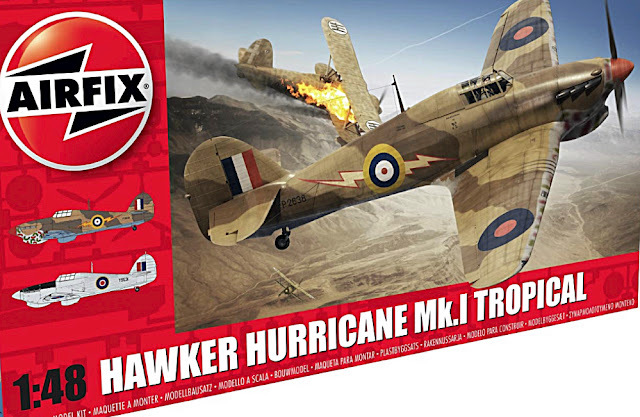 THE RUGGED HAWKER HURRICANE was perhaps the most important fighter in the Royal Air Force at the start of World War II. And here is the Airfix 1:48 scale model of a tropicalized machine, as flown in 1941 from bases in Africa. SMN report: Early RAF operations in the Mediterranean and North Africa saw Hurricane Mk I fighters pitted against first, the Italian Air Force, then the German Luftwaffe. An important modification for successful high temperature operations was the addition of a chin-mounted Vokes carburettor dust-filter, particularly so in North Africa. And this is faithfully reproduced in the new Airfix kit. One of two marking schemes supplied in the box (above), this snazzy-looking machine was flown from Sidi Barrani, Egypt, in 1941 by Sergeant Pilot FH Dean of No 274 Squadron. The other markings supplied are for an all-silver aircraft, flown by the Rhodesian Air Training Group. 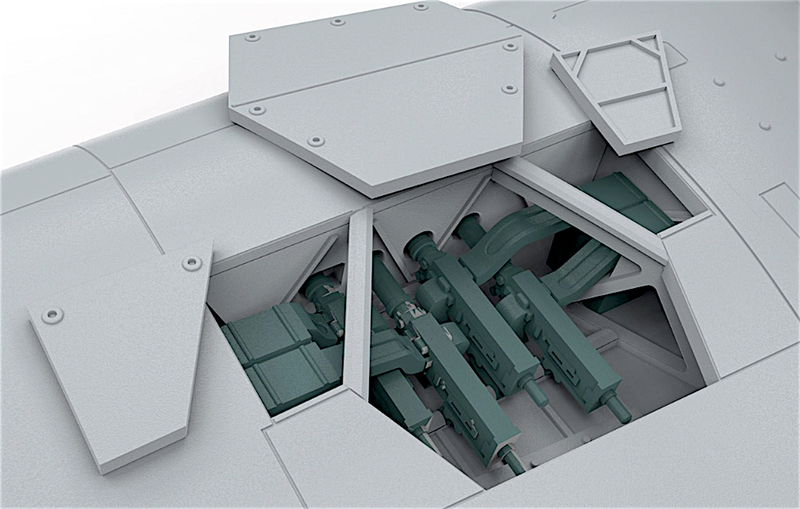 Cockpit detail is pretty good in this 1:48 scale kit (cgi image below). 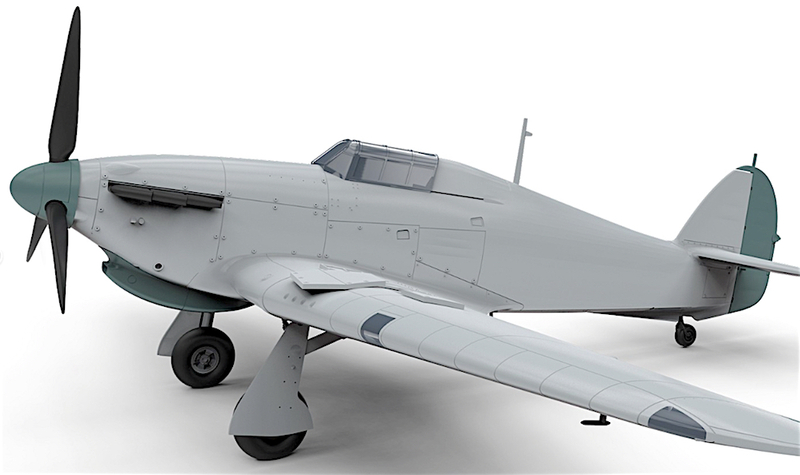 The finished model will repay the effort taken to detail the instruments and other components, especially if you show it off with the canopy slid back. 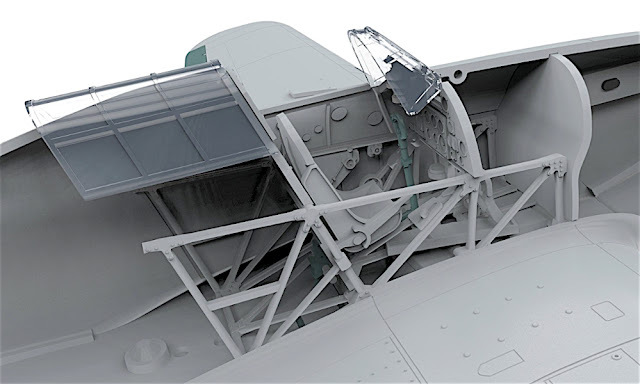 Wing guns and ammo belts (cgi image below) are included, as are the lift-off cover panels, giving you the choice of revealing them or not. This is one of those kits where plenty of ‘dusty’ weathering will pay dividends. The Hurricane wasn’t exactly pretty, and the Vokes filter under the nose (cgi image below) didn’t enhance its looks any. Not that appearance mattered to pilots, who simply wanted to fly and fight in a reliable aircraft. Easier to produce and fly than the more glamorous Spitfire, the Hurricane was a real warhorse of the air, being used widely, and especially so in the early years of World War II.